As you will recall from previous issues of the magazine, I’ve been covering in detail what it’s like to undergo the various treatments on offer by Gillian Huntley at appearances. As I always say, the best way to be able to write about things is to actually experience them so that is what I have been doing in order to give you a real insight into what it’s like to be in Gillian’s hands. Gillian is an experienced Aesthetic Therapist (I wouldn’t let just anyone carry out these procedures on me) who has been working in the industry for over 25 years, specialising in Advanced Aesthetics for more than 15 of those. She doesn’t just come highly recommended by her clients but also works closely with Cosmetic and Reconstructive Plastic Surgeons, nurses, technicians and consultants as well as many salons and clinics in Kent and the South East, including Essex. She can often be found at Options Beauty Salon on the high street where she will see some of her local clients or alternatively she has her own home clinic in Chislehurst which is where I have been visiting for the purpose of writing these features. Gillian is quite a miracle worker and she can do a lot for her clients to transform their lives and boost their confidence: skin peels, scar relaxation, specialist waxing, thread vein/pigmentation/skin tag removals, semi-permanent make-up and medical tattooing. 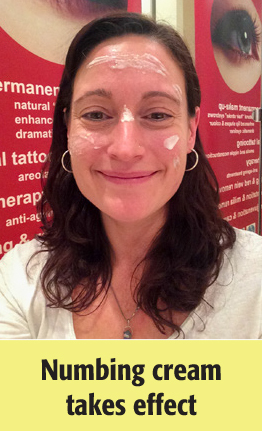 I was delighted that Gillian would be applying her miracle working numbing cream to the areas to be treated, so the first part of the process was allowing this cream to take effect. As with all treatments, Gillian will go over the process in detail with her clients so there are no surprises when she is using her ‘probe’ to treat the areas required. Each probe used in treatments is brand new and you get to see the sterile packaging it comes in. The process for this treatment is “Multitrepannic Collagen Actuation” which encourages the body’s own cells to regenerate resulting in wrinkles looking smoother and pitted scars effectively filling in and looking flatter. The same process can also be used for treating stretch-marks. This involved “Dry Needling” with a saline solution on the affected areas to abrade the skin. The probe tears and scratches the skin to encourage rejuvenation. A similar process is used for relaxing scars – “Mesotherapy” – a non-surgical cosmetic treatment involving multiple injections into the skin which breaks down elastin and collagen to encourage regeneration of the skin. Scars which are tight and restrictive are so because the skin has become knotted and doubled over inside. Some of the clients Gillian has treated over the years have had scarring following a hysterectomy or lymph nodes removed, both resulting in tight scars which have restricted their movement. So, what does the treatment feel like? I will admit that I didn’t feel a thing this time, the numbing cream really works a treat so there is nothing to worry about. 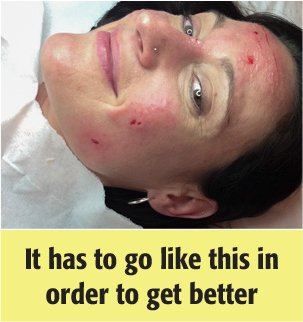 It was only until I took some pictures half way through the treatment that I could see the trauma caused to my skin. It has to go through this process in order for it to heal effectively. I will admit that in the picture it does look harsh and you certainly wouldn’t want to be going out the same day or even a couple of days afterwards as it takes this long for the skin to start healing. Throughout the procedure Gillian completely put me at ease with her friendly and chatty personality, talking through all the things she was doing to me so I didn’t have a thing to worry about. At the end of the session Gillian applied the repair cream and took me through the aftercare instructions which are very straightforward to follow. Every client leaves with a goodie bag of anti-bacterial hand gel, vitamin A + D cream to help with the healing process, witch hazel gel and anything else that your particular treatment requires. You can see why the aftercare is so important as the trauma my skin underwent is highly visible in the next set of pictures. I didn’t leave the house for a couple of days but now I’m delighted with how much better my skin is looking, my skin certainly appearing less pitted. 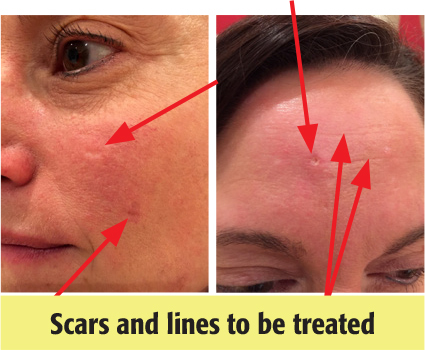 Prices for the scar treatments start at £125 and between 3-5 sessions may be required depending on the individual scars.